How large were the past changes in the sun? We only have direct observations of total solar irradiance (TSI) since the beginning of the satellite era and substantial evidence for variations in the level of solar activity (from cosmogenic isotopes or sunspot records) in the past. Tying those factors together in order to estimate solar irradiance variations in the past is crucial for attributing past climate changes, particularly in the pre-industrial. In the May issue of Astronomy & Astrophysics, Shapiro et al. present a new long-term reconstruction of the solar irradiance that implies much greater variation over the last 7000 years than any previously reconstruction. What is the basis for this difference? Their results do not deviate much from previous work when it comes to the most recent period with modern instrumental observations, but Shapiro et al. obtain substantially lower radiance during the Maunder minimum than previous estimates. Figure 1. TSI reconstructions from Schmidt et al (2011) with the new Shapiro et al (SEA) values all scaled to the same values in the last 30 years. How good are the new estimates? A major weakness of all such estimates – and Shapiro et al. is no different – is that the results cannot be tested on the basis of the last 30 years of solar observations. The paper is candid about this issue, and explains that this is partly because the time scale, on which their analysis rests, is 22 years. In any reconstruction, part of the analysis involves determining the degree which “magnetically enhanced contribution” contributes to the irradiance of the present “quiet sun”. These estimates were then scaled with the proxies for levels representing “quiet” sun activity. However, the long term variance in Shapiro et al is based simply on an assumption. 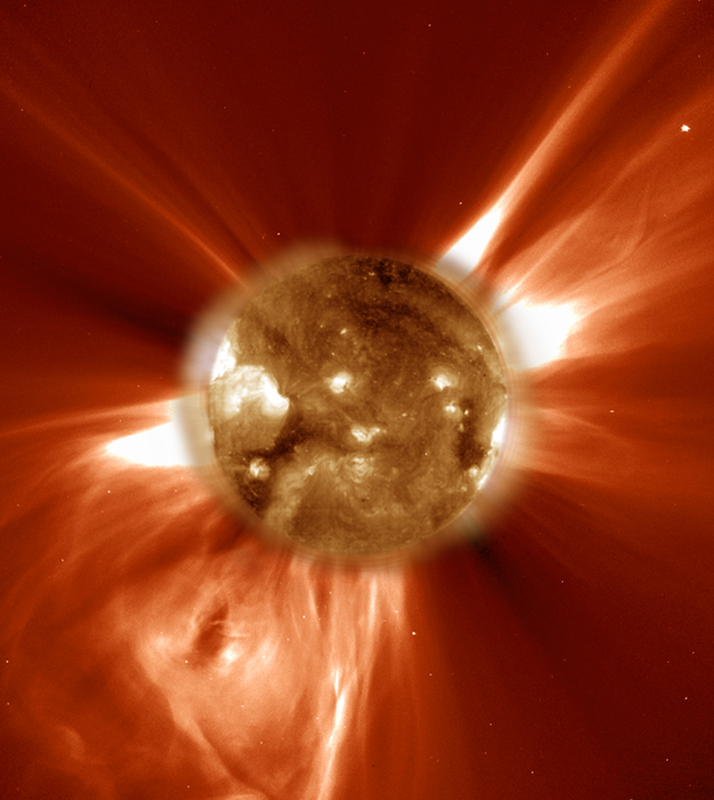 Specifically, they assume that there is a correspondence between the minimum state of a “quiet” sun (The article “Solar Myth” from NASA discusses the implications of a “quiet” sun in more depth) and the observed quietest area of the sun. The calculation for this area of the sun comes from Fontelna et al (1991), and Shapiro et al assume that during the deepest Grand Minima this controls the irradiance. But whether the sun could ever physically achieve this is unknown. Another recent paper, Schrijver et al (2011), makes a similar argument by analogy, but they simply assume that the Grand Minima are like the recent minima 2008/2010. Again, no physically argument is given, and no evaluation of the assumption is performed. So how do these new TSI-estimates relate to past climate variations and other forcings? Through paleo-climate simulations for the last millennium with climate models, a number of alternate forcing histories for volcanic and solar changes have been proposed to see their effect on past climate variations. However, such model studies cannot provide definite answers, as there is a range of possible model outcomes because the solar forcing is just one of several forcings (e.g. aerosols, greenhouse gases, land surface) that are not well-constrained by observations. … yields climatic conditions during past solar minima that are too cool and excessive fluctuations on timescales of several decades for Shapiro et al.’s  TSI reconstruction. His results were more consistent with temperature reconstructions if more traditional TSI estimates were used, with moderate difference between today and the Maunder Minimum, and that are in better agreement with the results presented in the recent IPCC report. Of course, these evaluations rely on the models being able to mimic the sensitivity of the real climate system and assume that paleoclimatic reconstructions of the temperature do adequately describe the past climate variations. For the global or hemispheric mean temperatures, either a reduction in sensitivity or an underestimate of past temperature variability could also explain the discrepancy. Using models to distinguish between the forcing histories is thus likely to require a tighter focus on regional changes, or in climate patterns, more than the just the mean temperature. There is still a great deal of uncertainty surrounding the issue of TSI reconstruction, though progress is more likely to come from a better understanding of the physics of the solar cycles than from simple, hard-to-verify assumptions. progress is more likely to come from a better understanding of the physics of the solar cycles than from simple, hard-to-verify assumptions. So, you’re saying this new paper doesn’t really tell us much of anything? Am I crazy, or does Schmidt et al (2011) use recent TSI studies, while this new TSI study is in closer agreement with older studies (considered by many to be wrong, outdated and generally superseded by the newer studies)? Beer et al. (2000) ← This one is notable for proposing a Maunder Minimum even lower than Shapiro et al. I have some estimates I have been playing with for contrast based on the quiet sun for the MM. This will cause me to add some new material for additional context possibly. The solar maximum in the 1950s could have a lot to do with our overconfident expectations for food availability. I think food might be reduced by a minimum like the years near 1460. There could be linkages to history. There was a higher peak in the 14th century. The Renaissance started in that century. Thanks for the linked papers such as Schmidt et al (2011) and thanks for this excellent article. Figure 1 is an awesome result. Since there is almost no difference between reconstruction past 1950, this as little impact on our understanding of the recent climate change. However, if large TSI excusion are true, this would also means that sensitivity is much lower for TSI than C02, which is hard to explain. Is there any chance that the models would have to produce temperature mismatches using the Shapiro reconstruction because they were calibrated and developed using the other, much-less-variable TSI reconstructions? According to the skeptics, the solar irradiance isn’t very important, it is the strength of the sun’s magnetic field (that allows or stops cosmic rays from coming in which then causes more or less clouds, which increases or decreases the Earth’s albedo, which then causes warming or cooling of the Earth’s surface). The really good thing about the climate “debate” is that the causations proposed by both sides – CO2 or cloud cover – will reveal themselves in the next few years. By 2015, by my estimate. By then either the Earth will cool – the sunspot/cosmic ray theory – or there will be a huge ramp-up in temps to account for the last 10 years of stability. With both sides so committed to their positions, there is little to no wiggle room. All to be decided soon. The AGW Denial-o-Sphere is going to treat this reconstruction as Received Truth. The difference in TSI between Shapiro et al and most other recent reconstructions (between Maunder minimum and the present) is about a factor of 10, but the difference in radiative forcing as quoted in this post (see the paragraph below) is only a factor of 2. Is it so strongly non-linear over this range or is something missing here? Edward Greisch: I get the sense you are taking away the wrong conclusion from this article. My reading is that Shapiro et al. is based on a big assumption, and that it doesn’t produce plausible results in climate models. The consensus position is still that TSI has varied little historically, although nobody has had the last word on the subject yet. Accuracy of the solar activity and pale-climatic reconstructions is questionable, since both are affected by changes in the geomagnetic field. Not necessarily. North Atlantic may be a good guide to the future. There are good data for the most parameters since 1950/60. Strength of the N. Atlantic’s currents index NAP (I have constructed) is on down-slope; the N. Atlantic pressure differential has parted the way around year 2000, while the SST is still holding the line. Well, that’s one reason given. “It’s the sun” is also very common. As are many other reasons, none of which are consistent with each other other than the “anything but carbon” theme that ties them all together. The problem with it being either the sun or cosmic rays is that we’ve measured both for 30+ years and neither show a trend that could possibly account for direct observations. The link for the Feulner paper in the main post is to the AGU abstract. It is beginning to appear that the more we know about the Earth’s climate, the more we discover we need to know. I suppose somewhere down the line there will be a new study linking the one discussed above with a new one concerning El Nino and human warfare. If I’ve read it correctly the draft paper by Hansen et. al., Earth’s Energy Imbalance and Implications suggests that many climate models underestimate the effect of positive climate forcings but also underestimate the effects of negative forcings due to aerosols. If correct how would this modify the reults of Shapiro et al.? P.S. Is mentioning a draft paper a breach of any protocol? If we accept the recent Lead and Rind paper that determines (via linear regression) a solar influence on global temps, over an 11 yr cycle to be about 0.1°C, then there may be an indirect solar forcing about equal to that from TSI. that being said, perhaps the sun could be responsible for a larger variation in global temperatures without requiring a larger TSI forcing. This would btw adequately explain the lack of temperature increase in the past 6-8 yrs?